All workshops have limited places so please check availability. The ‘Moon Mother initiation' given to you on the first day of the workshop is a gift of Divine Feminine healing energies, making you a channel for these vibrations and helping you to cleanse and clear your own patterns. You will learn a simple hands-on Womb Healing sequence to help women to gently heal their femininity and their womb energy centre or ‘Sacred Grail’. You will also be taught how to give the Womb Blessing attunement to women. Each time a woman receives the Womb Blessing attunement, her healing and the connection to the sacred feminine energies within her deepens. She will also be able to access the energy for her own personal healing and development. There will be plenty of time to practise. At the end of the course you will be a registered ‘Moon-Mother’ and be able to give Womb Healings and Womb Blessing initiations/ attunements. The course is certificated and there are accompanying notes. 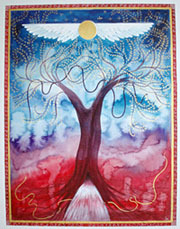 Working with the Womb Blessing energies changes us and changes our lives. Being a ‘Moon Mother’ is a path for bringing the spiritual energies of the Divine Feminine into everyday life and connecting women in a single, loving, spiritual, and female family. Each Womb Blessing attunement is a powerful gift of healing and may be given as often as required. You may use the Womb Blessing as part of your healing therapies, as part of your spiritual path or simply as a way to help women. Womb Blessings can be offered at Full Moon or Red Tent groups, they can help women through transitions and changes in their lives, and they can be a way to celebrate and acknowledge first menses, marriage, motherhood, and menopause. Who can do the training workshop? What to bring to the workshop? A pillow, a blanket or throw, and two small pretty bowls (about the size of a Chinese rice bowl). "I’ve had the honour of assisting Miranda’s Womb Blessing Initiation trainings as a translator and participant, and of experiencing the many gifts that this course brings to women’s lives. Building on what thousands of women have received through the Worldwide Womb Blessing, in this two-day workshop we regain a deep sense of the sacredness of our womb and our femininity. It offers us a pathway for expressing our spirituality in a way that resonates to us uniquely as women, and awakens and strengthens our connection to the healer that is in all of us. We go away from the course with two very practical and powerful tools - a hands-on Womb Blessing and a Womb Healing- to offer in service to other women who seek to reconnect with the Divine Feminine and celebrate their womanhood."